On THU evening I attended a private dinner organized by Cramele Recas at Mesogios restaurant in Bucharest where I tasted some wines produced by Gonzalez Byass. 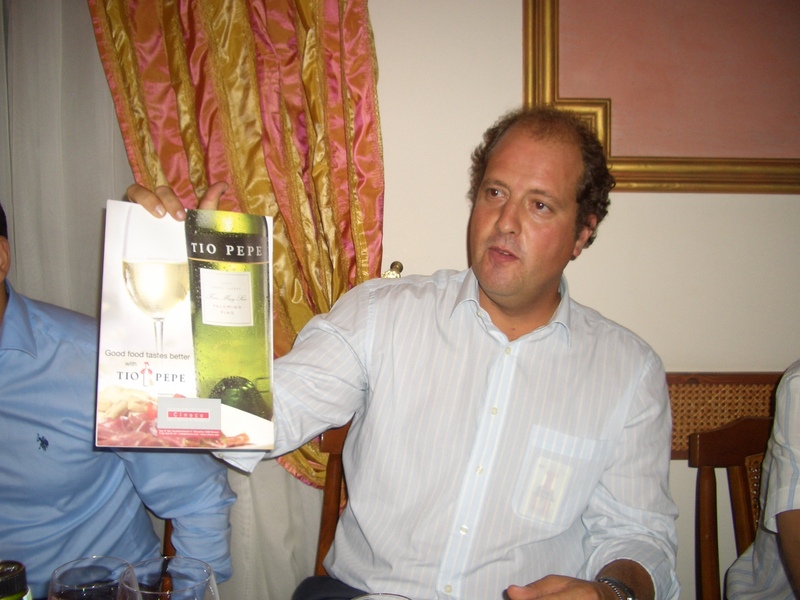 The purpose of this unexpected tasting was the visit of Gonzalez Byass Regional Sales Director – Mr Oscar Bayo in Romania. Aside from Recas representatives and Mr Bayo, the other participants were Vali Ceafalau from Vinul.ro, and two other wine bloggers: Nicusor Cazan and Razvan Jurca. The atmosphere was friendly and Mr Oscar Bayo did a good job explaining us the history of the company and gave full details about the wines we tasted. The company Gonzalez Byass has been established in 1835 in the Jerez region, it is still a family owned business and it is now at the 5th generation. They produce wine in different regions of Spain: Rioja, Toledo, Jerez, Somontano, Penedes and Cava. We started the tasting with a dry sherry Tio Pepe Fino Muy Seco served with appetizers. Sherry is made from 100% Palomino grapes. After fermentation is complete, sherry is fortified with brandy and reaches 15% alcohol. Because the fortification takes place after fermentation, most sherries are initially dry, with any sweetness being added later. 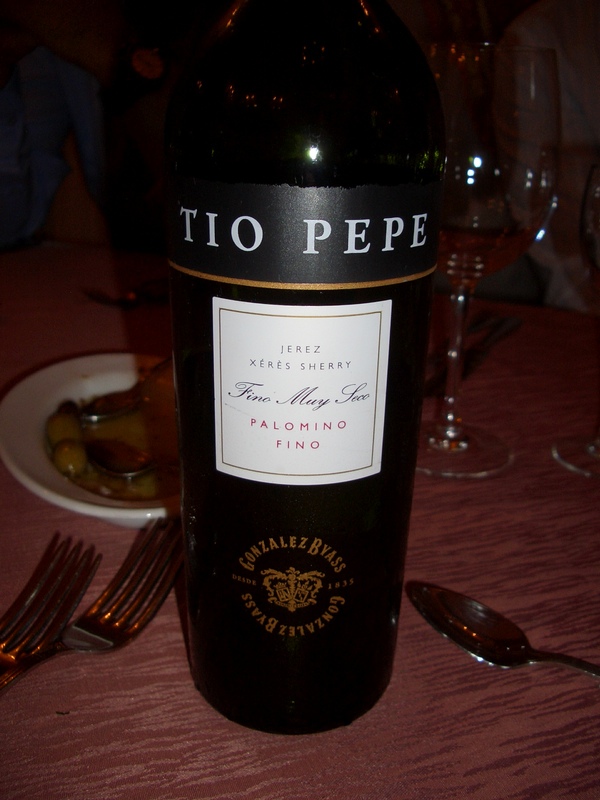 Tio Pepe Fino Muy Seco has a pale yellow lemon color and a sweet-sour nose dominated by aromas of bitter fruit seeds, brown sugar and almonds. The pairing with olives is perfect. While on its own you can feel the alcohol, in the company of olives the wine blossoms. Mr Bayo also recommended serving sherry with sea food dishes, sushi and most types of cooked fish. We had our sherry with a crab salad and Jamon Iberico, but for me the olives were the best pairing. The second course of the meal was grilled tuna with rice. The wine served was a Rioja and the iconic wine of Beronia winery: III a.C. Gonzalez Byass owns about 20 ha of vines in Rioja, but controls another 840 ha through long term contracts. That’s about 10% of the entire Rioja region. 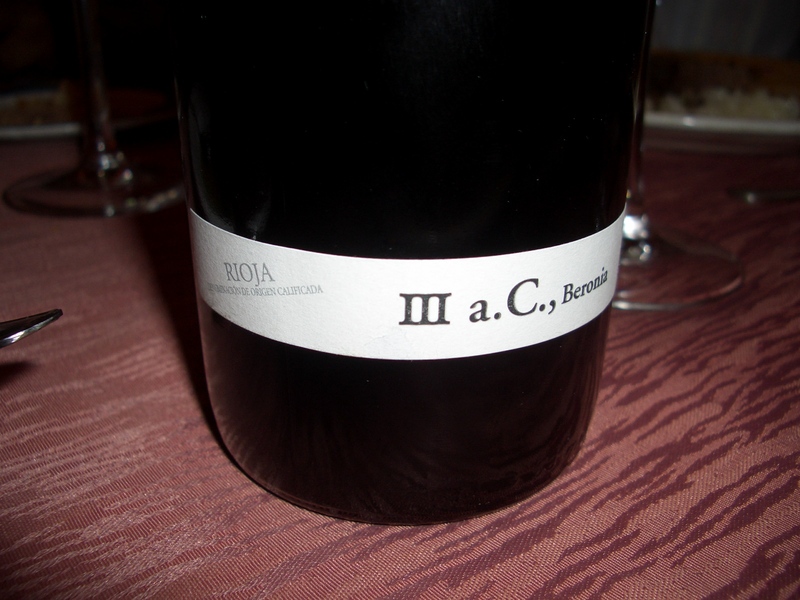 Beronia III a.C. 2008 is a blend of 92% Tempranillo, 4% Graciano and 4% Mazuelo coming from 55-60 years old vines and aged for 15 months in new French oak. Third course of the meal was a mix of grilled octopus and king prawns on a bed of stewed tomatoes. 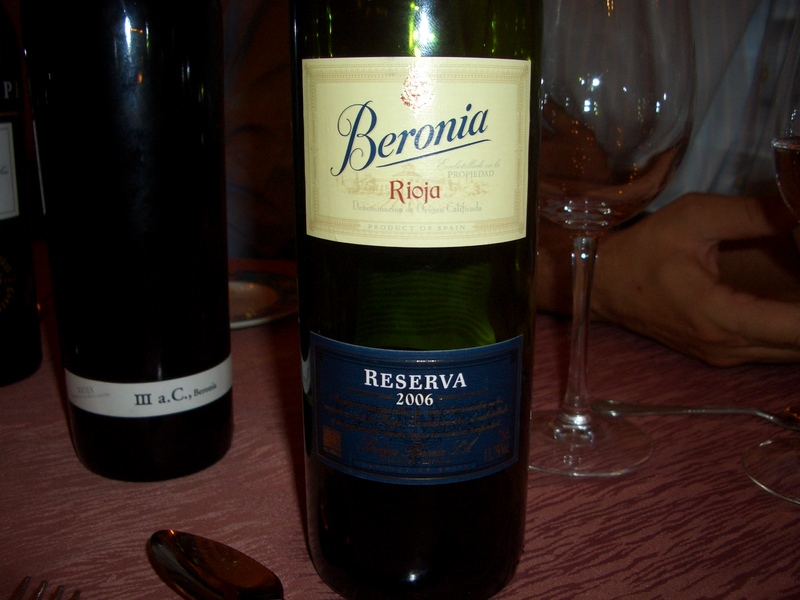 A traditional style Rioja wine was served: Beronia Reserva 2006. A blend of 90% Tempranillo, 5% Graciano and 5% Mazuelo, the wine was aged for 18 months in mixed American and French oak barrels. Beronia produces a Reserva each vintage and a Gran Reserva only in the best vintages. 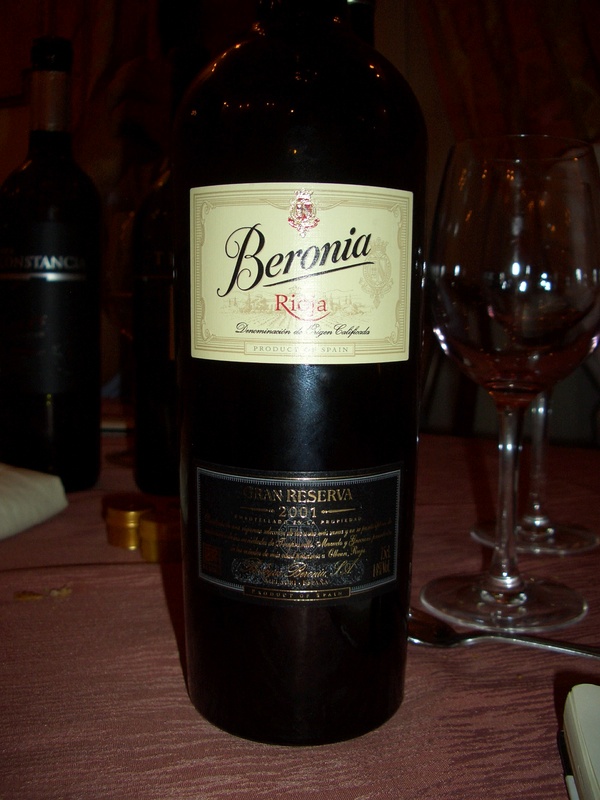 The highlight wine of the night was, for me, the Beronia Gran Reserva 2001. It was a great match for the earthy aromas of the octopus. Blend of 88% Tempranillo, 8% Graciano and 4% Mazuelo, aged for 24 months in mixed American and French oak barrels. 2001 was an exceptional vintage for Rioja. 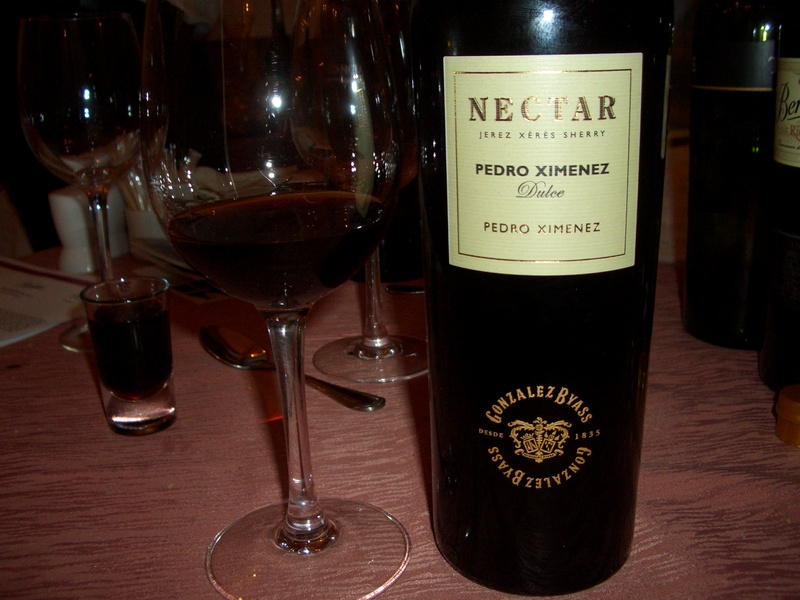 The dessert was accompanied by a Nectar Pedro Ximenez Dulce having 370 gr of sugar per liter. Death by sweetness. An oxidative dark brown color(the wine spent about 9 years in American oak following the Solera system). A rich nose with intense aromas of figs, caramel, dried fruits, dried grapes-sultanas, nuts and spices. Unctuous on the palate, velvety mouth-feel and a long and persistent sweet finish. One glass of this wine and is enough. A bit too sweet for my taste. Gonzalez Byass has a large portfolio of products – we counted together with Mr Bayo about 94 distinctive products in their catalog – but there is quality and attention to details for all of their products. Interesant. Pe site-ul Recas vad ca nu au Gran Reserva. Ai idee daca exista totusi in portofoliul lor? Ciprian din cate am inteles eu aseara ei se gandeau sa aduca. Au vrut sa vada ce parere avem si noi. Eu sunt un ferm sustinator sa aduca Gran Reserva 2001 mai ales ca ajunge pe la 30-40 Eur maxim din ce am vorbit aseara. Nici reprezentantul Gonzalez Byass nu era sigur daca mai aveau 2001 pe stoc, a ramas ca o sa verifice azi. Problema este ca vinurile spaniole in afara de Torres, care exista de vreo 7-8 ani deja listat in locatii nu prea merg pe piata din Romania. Urmatorul an in care au facut Gran Reserva din ce am inteles eu ar fi 2004 si 2003 parca. De 2003 nu-s sigur pentru ca a fost un an foarte calduros, prea torid. In schimb 2004 este tot asa un an excelent pentru Rioja. Am inteles, Cosmin. Mersi mult pentru info.